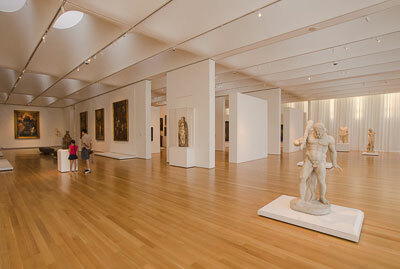 Known as the Smithsonian of the South, Raleigh is home to more than 40 free cultural attractions. From museums and historic sites, to galleries of every sort, there’s no shortage of free accessible diversions in this North Carolina capital city. Couple that with a free wheelchair-accessible downtown shuttle, and you have all the ingredients for a very accessible and affordable getaway. Downtown Raleigh is easy to navigate on foot, as the city is filled with wide level sidewalks, with curb-cuts at every corner. If you want a little break, then just hop on the free R-Line downtown circulator bus. These electric buses stop at or near most downtown attractions and they run every 10-15 minutes. Access is good too, as the kneeling buses feature dedicated wheelchair spaces. It’s the quick and easy way to get around the downtown area. The best plan of action is to park at the Marriott parking garage, as it’s close to the Visitors Center. Granted, the signage is a bit confusing in the garage, but they have plenty of accessible spaces, with elevator access up to street level. Don’t forget to stop by the Visitors Center — located between the Marriott and the Convention Center — to pick up a R-line map, before you set out for the day. 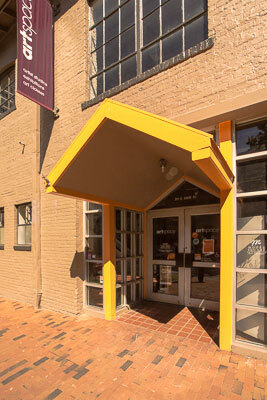 Artspace (919-821-2787, www.artspacenc.org) is a good place to begin your downtown Raleigh visit, as it’s located just a few blocks from the Visitors Center, on Davie between Blount and Person Streets. This 30,000 square-foot building is home to over 30 artist’s studios, three exhibition spaces and a gift shop. There is level access to the building and barrier-free access to all the galleries and studios. A loaner wheelchair is also available at the front desk. The exhibitions change often and you never know who will be in their studio, so every time you visit this downtown gem, you’ll have a entirely different experience. The studio artists work in a variety of mediums, including photography, textiles, metal, wood and mixed media. It’s a great opportunity to see artists at work, as it’s the largest open studio in America. 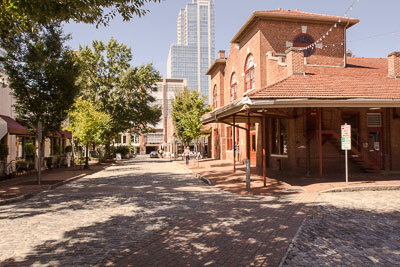 Artspace is also one of the largest tenants in City Market (919-821-8023, www.citymarketraleigh.com), which contains a collection of galleries, boutiques and eateries. Farmers used to load up their wagons and hawk their goods to city folk here, back in 1914. Today the buildings are restored and there is level access to most businesses; however the cobblestone streets can be troublesome for wheelers. That said, it’s best to enter from Blount Street, as it’s a much smoother pathway than the one from Martin Street. Additionally, since there are a number of sidewalk dining venues in the complex, you may encounter the occasional misplaced chair, but for the most part access is pretty good. With a wide variety of restaurants, it’s a good spot to stop for lunch. Founded in 1587 by Sir Walter Raleigh, the capital city boasts a long and colorful history. 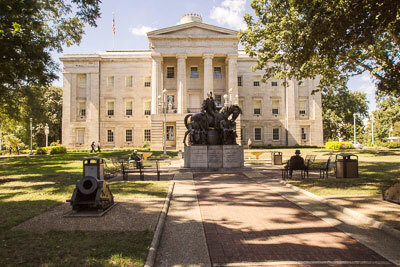 And there’s no better way to immerse yourself in it than by visiting Raleigh’s historic trifecta — three downtown sites that trace the roots of the city and offer a good overview of key historic events from local, regional and national perspectives. The best place to begin your journey through history is at the City Museum of Raleigh (919-832-3775, www.raleighcitymuseum.org), located in the Briggs Building, on Fayetteville near Hargett Street. Once home to the Briggs Hardware Store, the building dates back to 1874. Access is good throughout the building with a level entrance, power doors and barrier-free access to the first-floor museum. The museum features rotating exhibits that highlight Raleigh’s history, but the building is a treasure by itself. Take some time to admire the architecture, and don’t miss the unique tin ceiling in the museum gallery. From there, head north on Fayetteville for a block, until it dead ends at the North Carolina State Capitol (919-733-4994, www.nchistoricsites.org/capitol). There is good pathway access through Capitol Park, to the visitors entrance on the east side of the building. Although stairs lead up to the door, there is ramp access on the right. Inside there is elevator access to all floors of this well preserved Greek Revival building, that originally housed the governor’s office, cabinet offices, state library and the state geologists office. Today, many of the rooms are restored to their former glory and decorated as they were in the 1850s. Although there’s no admission charge, the $5 audio tour is highly recommended, as it paints a very vivid picture of the historic figures that once roamed the hallways. Wrap up your history stroll with a visit to the North Carolina Museum of History (919-807-7900, www.ncmuseumofhistory.org), located across the street from the Capitol. There is ramp access to the entrance, barrier-free access through the galleries, and a free loaner wheelchair available at the information desk. 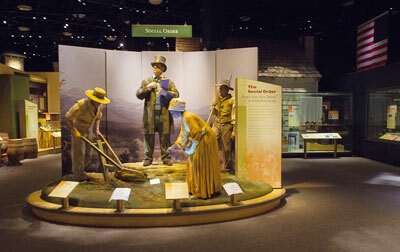 The Story of North Carolina, which is located on the first-floor, draws on the museum’s permanent collection as it traces life in North Carolina, from its earliest inhabitants through the 20th century. Highlights include stone tools that were used by the state’s natives, a full-size replica of the 1903 Wright Flyer, a lunch counter from the 1960 Salisbury civil rights sit-in, and a re-created room of an early 20th-century textile mil. The museum also has an impressive collection of Civil War artifacts, and it features a variety of rotating exhibits throughout the year. To round out your downtown visit, be sure and stop in at the North Carolina Museum of Natural Sciences (919-733-7450, www.naturalsciences.org). Located next door to the North Carolina Museum of History, this museum focuses on the natural side of the tar heel state. Billed as the largest museum of its kind in the Southeast, there’s good access throughout the building, with level access to the entrance, elevator access to all floors and loaner wheelchairs available at the front desk. Unlike your average museum, the exhibits encourage visitors to explore the natural world around them, and to discover their connections to it. Highlights of the museum include the Terror of the South exhibit, where dinosaurs roam the land and pursue their prey; and the Mountains to Sea Overlook, which explores life in the treetops and overlooks the Piedmont and Coast Plains exhibits below. And don’t miss the Living Conservatory on the fourth floor, which is filled with tropical plants and animals. It’s almost like being in a tropical forest. After you’d had your fill of Mother Nature’s delights, you can either walk the eight blocks back to the Visitors Center, or hop on the R-line and take the circuitous route there. The latter option not only gives you a chance to rest, but it also offers a nice tour of the downtown area. And like everything else mentioned here, it’s completely free. 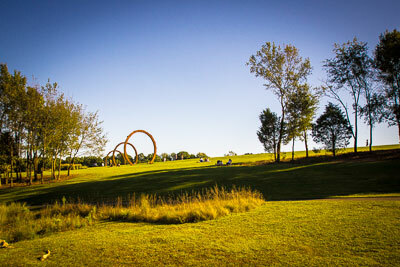 Although it’s not located in the downtown area, the North Carolina Museum of Art (919-839-6362, www.ncartmuseum.org) is also worth a visit while you’re in town. Save a whole day for this top-rated attraction, and make plans to explore the sculpture garden and grab a bite to eat at Iris, the museum restaurant. Accessible parking is available in the Blue Ridge parking lot, (take a right after turning on Museum Drive), with an accessible path over to the entrance. There is also accessible parking directly in front of the museum entrance, at Gibson Plaza; plus a drop-off area between the East and West Buildings. To reach this area, take a left after you turn in on Museum Drive, and follow the signs. There is level access to the entrance, and barrier-free access throughout all of the buildings. Additionally, power and manual wheelchairs and rollators are available for loan at the information desks in both buildings. The west building is home to the museum’s permanent collection, which includes a large collection of European paintings dating back to the Renaissance, Egyptian artifacts, African and Judaic works of art, and a nice collection of contemporary art. And if that’s not enough, it’s also the home to the country’s largest collection of Rodin sculptures. Make sure and bring your cell phone as the excellent cell phone tour includes remarks by the museum’s curators, educators and invited scholars. Save some time to wander through the sculpture garden, and explore this intersection of art and nature. Although some areas of the garden are a bit steep, a fairly accessible route begins near the amphitheater. Just follow the asphalt path out to the pond, then take the Greenway Trail back to the Blue Ridge parking lot. The whole route is just under a mile long, and it’s a very pleasant way to top off your museum visit.